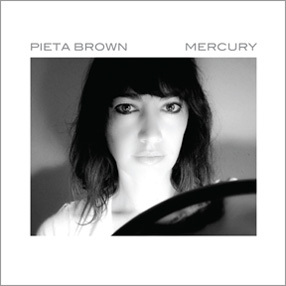 Red House Records is pleased to announce the September 27, 2011 release of Pieta Brown's magnetic new album Mercury. Saturated in her mercurial phrasing and mesmerizing melodies, this highly anticipated new release evokes the sounds of her native southland with raw folk and Americana songs that have strains of Gillian Welch and The Civil Wars with the radio-friendly allure of Feist and Ray Lamontagne. Recorded live with all the players in one room out in the country west of Nashville in just three days, it features a who's who of great session players, including Grammy-winning producer/player Richard Bennett (Mark Knopfler, Steve Earle, Emmylou Harris), bassist Glenn Worf (Mark Knopfler, Aaron Neville, Tammy Wynette), drummer Chad Cromwell (Neil Young, Mark Knopfler), multi-instrumentalist David Mansfield (Bob Dylan, T-Bone Burnett, Johnny Cash) and her frequent collaborator Bo Ramsey (Lucinda Williams, Greg Brown). Mark Knopfler also adds his inimitable touch to the blues stomp "So Many Miles." Pieta met many of these players while touring with Mark Knopfler and his band last year, during which time they developed a genuine connection with her music. Fittingly, the album ends with the stunning "No Words Now," a song she wrote back stage one night after hearing Mark and his band play live. "All the songs came fast," Pieta says. "Words and melodies arrived intertwined..some like visions, some as simple memories, some like urgent messages." Piecing together torn scraps of love and loss, coming and going, addiction and sobriety, nature and destruction, Pieta confirms that she is "one of the best modern songwriters" (Sonic Boomers) and a true poet, speaking to life in these uncertain times--from the sparkling title track "Mercury" (released in August as a digital single) to the gospel-tinged "Glory to Glory." Sometimes contemplative and other times brimming with energy, the album is infectious with country-esque numbers like "Be With You" and "I'm Gone," evoking the spirit of Lucinda Williams' classic album Car Wheels on a Gravel Road. Making the record of her young career, Pieta shows her star isn't just on the rise; it's already here, shining bright for us all. "Not long before I made this recording I had a dream about going back south...visions of my Alabama childhood," Pieta says. "In the dream I was intent on making this recording in the south. A few days later the invitation to record in a one room studio called Lamplight out in the country in Tennessee. The photo I received of the place was so like the barn in the dream I was rattled." She followed the tracks to Tennessee, joining an all-star cast of players to create a recording experience that none of them would ever forget. Pieta Brown, Bo Ramsey, Chad Cromwell, Glenn Worf, engineer Mark Polack and I huddled in a barn-like recording studio an hour west of Nashville on 20 acres of rolling land. We emerged three days later with Mercury. Pieta's songs and melodies are beautiful, mystical, at times frightening. Her voice pulls you in to every story, every word and holds you there helplessly. Among the many miracles about Mercury are those disarming vocals, recorded live as Pieta was also playing some very righteous guitar. Records are not made this way anymore and there aren't many artists capable of pulling that sort of thing off for three days running or even just one song. Most artists aren't Pieta Brown.